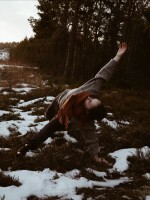 Trappstigen 3 I’m Karin, a strala yoga guide and a Freelance Dance artist and teacher based both in Sweden and Berlin. I have always been dancing and got my dance education as an international student at Dance New Amsterdam and Peridance capezio center in New York. During my time in New York I dicovered strala yoga and later I completed my 200h ready to lead 2016 in Berlin. I have tried alot of different styles of yoga, like Ashtanga, Hatha and vinyasa. But strala was the style that caught me the most, just because it simply makes me feel great. Now I guide classes in Stockholm.